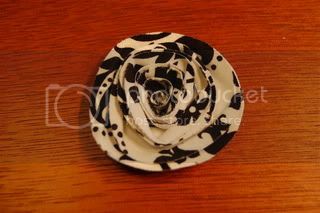 Welcome to my Material Girl Fabric Flower Class! 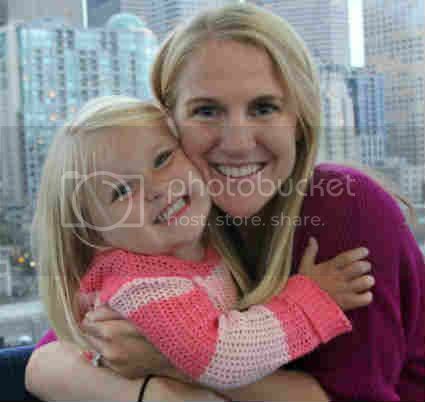 This is my variation of a class Alissa and I took together at CKC. 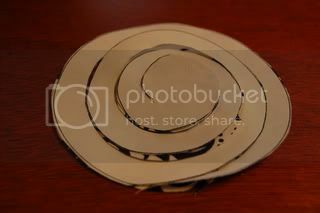 First, you will need to draw a template on a scrap piece of paper, making a swirly circle like the one shown below. You can make it any size you like. Just remember that the larger your template, the larger your flower will be. You can also make a few that are different sizes for some variety. 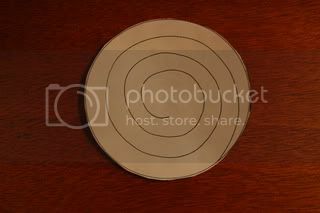 Leave about 1/2" space between the rings of the circle. Make sure you leave a fairly large part of the center open as this will be the base of your flower where you will glue it together. 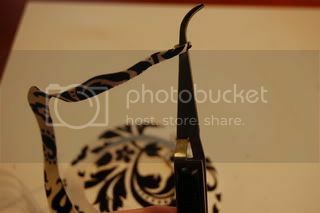 Cut a piece of light or medium weight cardstock about the same size as your fabric scrap. 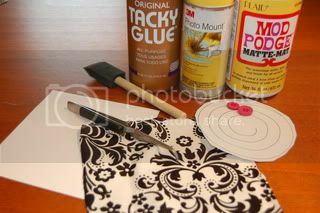 Paint a thin layer of mod podge on the cardstock and adhere your fabric to it, smoothing out any wrinkles. 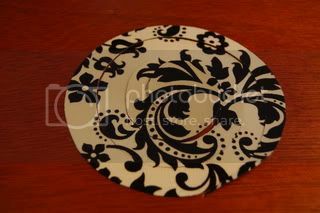 Allow mod podge to dry for a few minutes. 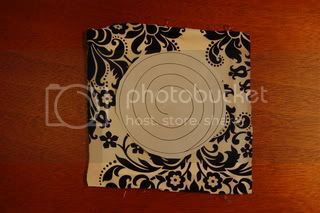 Lay your circle template on top of the fabric, and cut around the outer edge. Now cut the swirly part of the circle, following the lines you drew. Here is what you have when you remove your template. 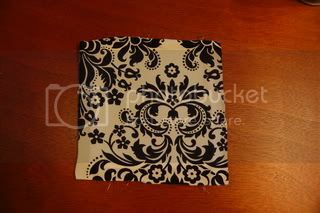 Turn your fabric over, with the cardstock side facing up. 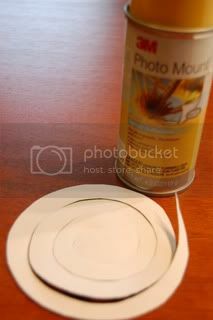 Lightly spray the cardstock with some spray adhesive. 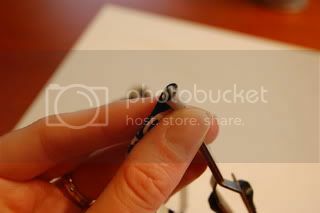 If you have a quilling tool, insert the outer edge of the circle in it. If you don't have a quilling tool, tweezers work fine. Roll the fabric toward you so that the fabric is on the inside and cardstock on the outside. Keep rolling until you reach the center of the circle. 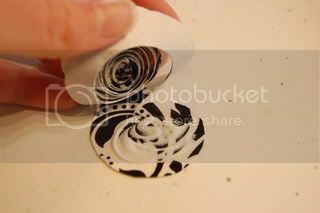 Holding your rolled circle together, gently pull your fabric off the quilling tool or tweezers. Allow the fabric to slightly loosen and unwind a bit. 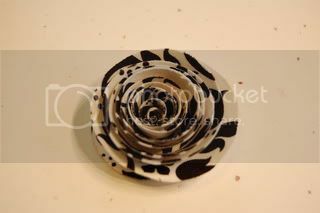 Adhere the flower to the base with glue. Use your hand or foot to sort of mash down the petals. Adhere a button to the center, and you are done! Now it's your turn! Complete this class and upload it to our gallery in the proper folder, Material Girl, under "May Crop Challenges & Classes" by Saturday, May 21st at midnight EST. You may enter up to THREE projects per person, per challenge. Two page layouts count as one entry, even if you upload each side separately. Projects must be NEWLY CREATED specifically for this challenge. You cannot combine challenges. I hope you enjoyed my class and had fun making your fabric flowers! Be sure to check out my Material Girl challenge related to this class! I can't wait to see what you all create! 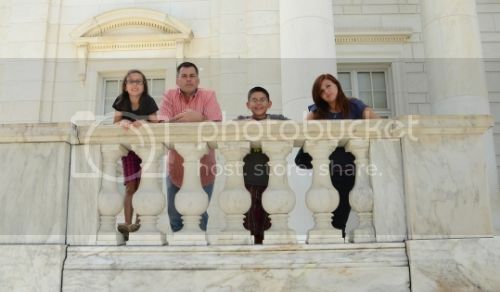 Last edited by skinnimini on Fri May 13, 2011 8:54 am, edited 1 time in total. Very cool Deb! Can't wait to try it! What a great little flower! 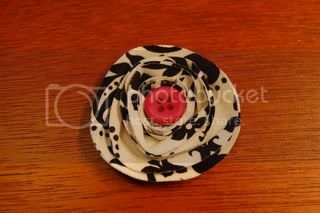 I LOVE using fabric on my layouts and to make flowers with so this is a must try for me! Good idea! Let us know how it works! I haven't actually ever used the stuff yet---so reading it--I am not sure--I may try it--but right now I am going to follow your directions--I will let you know when i do try it. I've made two flowers so far--but I guess I didn't let them unwind enough--the centers are so tight--I can't really fit a button there--but I am still working on more! I am working on some of these too.